A Passion for Play: SNOW DAY! We are officially snowed in here in Chicago with over 18" of snow. Living in the city means that our streets won't get plowed for a few days and once you dig out your parking space, you don't want to leave for fear that you will lose it. So... we're here. Inside. For at least a day. Or two. Which is great news for you (and me, too, I guess) because I can get caught up on the all the blog posts that have been marinating in my head waiting to get out to the blogosphere. On a snowy day, I can't think of a better activity than making coffee filter snowflakes. You really don't need much: Coffee filters, markers, water colors, safety scissors and whatever other decorating materials you can conjur up. 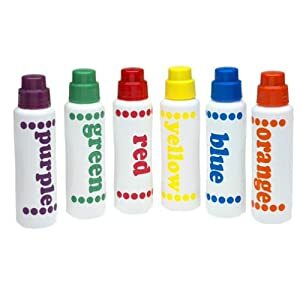 Personally, I love using dot markers for this activity. They are fantastic tools for children of all fine motor abilities. When it's time to cut shapes into the filter, just fold into quarters and cut cutting. Younger artists may need you to draw shapes onto the filter to help them know where to cut. Your child will love opening up his/her snowflake to see the design. Be sure to hang them on a window for the full effect!